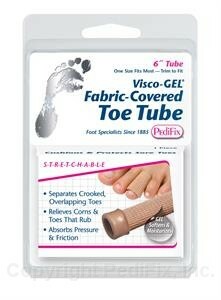 Soft fabric with Gel lining surrounds and separates toes. Cushions and protects to relieve corns, between-toe friction and irritation. Divides crooked, overlapping toes. 6″ long piece. Trim to fit. 1 per pack.